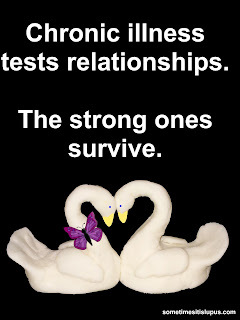 Lupus puts stress on all parts of life. Sadly, for some people, that means relationships and family life seem to come unstuck. The strain of having one person continuously sick is just too much. 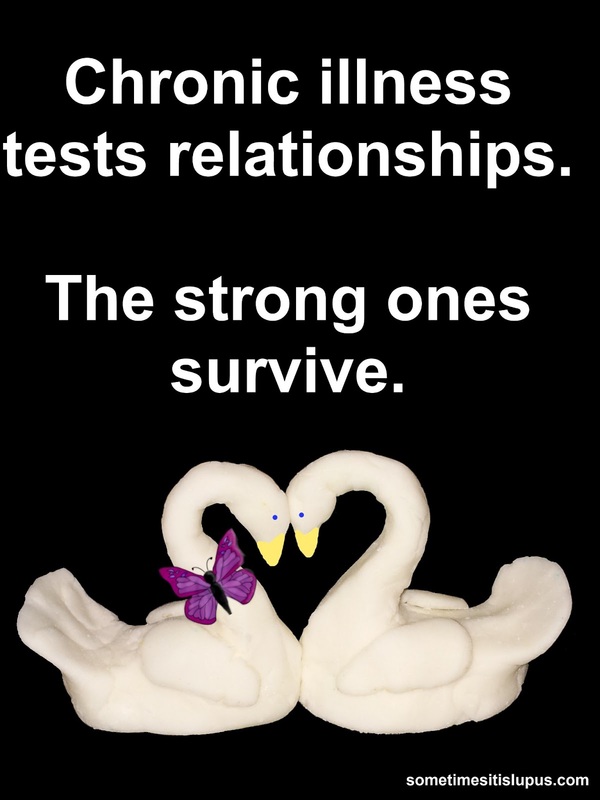 It can be made worse if partners or family members don't understand what it is like for a lupie to live with pain, fatigue, and other symptoms. Sometimes, family can even be resentful because a lupie just doesn't seem to do their fair share. Happily, there are some lupies who are able to say their partners and families are very supportive, and have very strong relationships. In Switzerland, programs exist to help family members before "it's too much". Another person like a nurse or a social worker come home every day for a while to help, or to allow the family members to have "holidays". The problem is, too many people don't know that some help exists, or don't dare to appeal to it. The fatigue aspect of this is difficult to like myself through. I can see that things need to be done and I see that things are not being done and everyone around me has been doing and doing and I haven't. I fear of seeing the disgust I feel for my lethargy reflected in the eyes of the people closest, who pick up the slack I resent leaving. On good days I need to focus on limiting myself or else face an even lower low and a longer recovery through which I don't look sick. I think most of us carry a sense of guilt for all the things we can't do. The guilt doesn't help anything, but even knowing that, doesn't stop us feeling it.